I wish it was just the ending that bugged me about this. Previously, before this book and Forever Too Far, I would have been singing Abbi Glines name from the rooftop. But it is impossible for every book to be great and amazing. Everyone has a few duds. 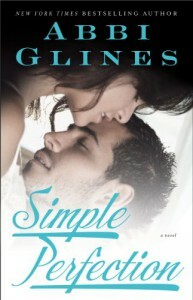 For as many books as Glines has out, her record will still be in the positive. Firstly, this starts right off on the cliff hanger from the first Perfection book. Which was fine. But the storyline of Angelina Greystone seemed to mysteriously drop. I had figured after the altercation that Angelina would have found a way to strike back. But it seemed this plot line was forgotten. It was left unresolved. The misunderstanding. There are many plot devices used to create conflict and this seems to be the number one used device in romance. Which is alright. But mostly I'm sick of it. I'm tired of the heroine always running away (Blaire and Della). I'm tired of a fragment of a conversation being the deciding factor for if a character stays or goes. Why does the heroine never confront the hero when this happens? I could have respected Della more for it. I would have found her struggle with her fears better if she hadn't run at the first sign of trouble in paradise. I was a bit disappointed with the Bethy development. It was out of character for her to suddenly start acting like a barfly again. I was disappointed with this scene. A character killed off to make room for another couple to get a book. I see a huge problem with this. We watched through the Too Far series Bethy and Jace develop a relationship. It was working. They rarely had problems and were always there for each other. This was nothing more than a major screw up that doesn't work. Not only was it out of character for Bethy to go acting like this, Woods turning into one big pile of needy goo was also out of character. The worst part was I wasn't even sad. By the time this happened I couldn't have cared who lived or died. The story was so far off track. Maybe Glines can find a way to get it back on track, but it won't be with Bethy's book.